Prerequisite(s): Students taking this course must meet the following general requirements: Class III or better whitewater kayaker with reliable roll Required creek or river running kayak (no playboats or IKs please) Float bag(s) in kayak recommended River rescue PFD (Type V) with tow tether Be involved in the process of learning to kayak, raft, river board or canoe. Have an understanding of basic hydrology and be familiar with identifying basic features such as an eddy, eddy line, standing wave, hydraulic, hole, etc. Have some familiarity with basic rescue equipment such as throw bags and carabiners. 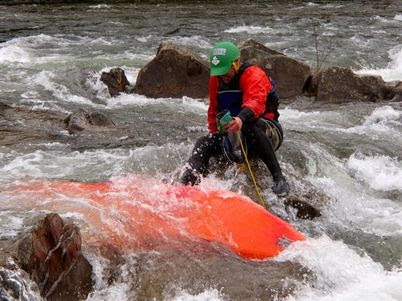 This RRC Course is being specially offered for whitewater kayakers. The class will feature some of the latest in kayaker safety, proper gear usage, towing unconscious swimmers and boats, rescuing gear and many of the challenges faced by whitewater boaters today. Emphasis is on identifying hazards and on RESCUE itself; both of self and others. Thinking through rescues is also emphasized. This is the class you want as a boater to stay safe and know what to do if something goes wrong. The two day format makes the course more affordable and accessible. This course should be a prerequisite to anyone boating on any river anywhere!